They don’t have the money together yet for the project. They’re undecided and need time to think. It’s just not the right vibe. You might really need this project because you need the income, but this person is just not ready to get things started right away. Maybe it’s not about the money for you — you feel passionate about taking on this project and helping this potential client succeed. If you’re wondering what steps you can take to avoid this from happening — or what you can do to turn this client around — then you’re in the right place. Let’s get straight to the tips! Get the important information right away from your contact/booking form. Asking the right questions ahead of time can help you weed out folks who you aren’t interested in working with on projects. Here’s what you should ask. What is their budget or investment? Based on whatever your criteria is, you should be able to figure out right away if this person might be a good fit for you. For people who aren’t, send them a email thanking them and recommend them to someone else if it makes sense. Reputation is everything and by being kind and helpful it avoids leaving a bad taste in their mouth about their experience with you. Limit the time of your consultation. How can I help you? Dig deeper if they aren’t specific about the problems they’re having. Have you ever worked with a designer before? Ask about their experience — the good and the bad. What are your expectations for the project and your deadline? Discuss how you can solve their problem, how long it will take, and what it will cost them. Some clients might want to spend a lot of time discussing features they want or spend time showing you the exact look they want for their project, but you should spend this time getting to know each other and defining the scope of the project. You can discuss details of the project after you’ve decided you actually want to work with the client. If the client is still unsure or something is holding them back, follow up! Sometimes it’s just not the right time for them or their budget isn’t necessarily where it needs to be in order to get what they want. By following up with them, this shows that you care about their concerns and that you’re willing to be patient. Put a reminder if your calendar to follow up in a week or two. Try to limit the amount of attempts you make, because sometimes that potential client could change their mind totally if you follow up too much. After three follow up attempts, think about if it’s worth continuing. Also, if they’re not connected with you on your email list or on social media, ask them to do so in order for them to stay connected with you and your business. Ask them why they hired you (or why they didn’t hire you). Maybe you were too pushy in selling them your product or service. Maybe your prices are too high for them. Maybe they are a stickler about time management and you were a few minutes late for a call or meeting with them. Everyone’s experience might be different, but this feedback will help you with future consultations. Have project standards and stick with them. The worse thing you can do is to go with the flow and allow a potential client to dictate how you run your business just because you want the money. This means you have to know how you like to work, the best way to communicate with you, etc. By having these project standards, you will no longer accept just anyone, any price, or any terms. Bonus Tip: Always avoid starting a conversation out discussing money. Try to work on building a relationship and figuring out the problem first before discussing money. 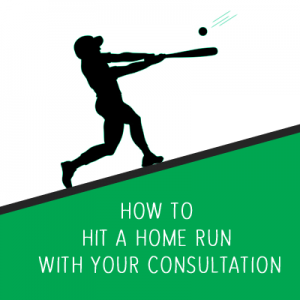 What are some issues or concerns you have when having a consultation with a client? ← Help Us Reach Our July 2014 Fundraising Goal!